Thaddeus Webb has run away. Again. On the edge of Edinburgh he’s trying hard to stay out of trouble. Now it looks like trouble has found him. When Thad stumbles across someone who’s been scamming innocent tourists, he feels he must put a stop to their nefarious activities. But things are not all they seem, and before long he finds himself mired in a murder case and entangled in a terror plot. Thad is uniquely positioned to avert the impending atrocity. The only problem is, he doesn’t know where it will happen, or what form it will take. With a forgotten ghost from his past emerging from the shadows, and another from more recent events always lurking, he must use every trick he knows — legal or otherwise — to unravel the truth and save innocent lives. 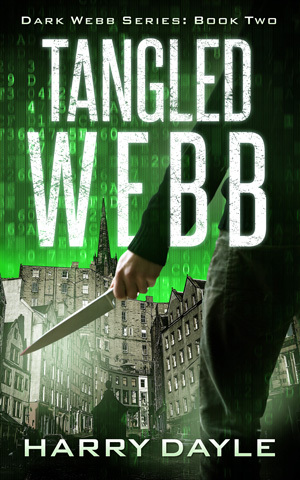 Tangled Webb is the second book in Harry Dayle’s exciting Dark Webb series.